The biggest take away from NYFW Spring 2019? Fashion Week is not for the weak. Fashion Week turned into fight club on Sept. 7 when Cardi B and Nicki Minaj got into a now-infamous heated altercation at the Harper's Bazaar Icons party, with photos of the "Bodak Yellow" rapper being escorted out of the venue shoeless and with a large mark over her left eye instantly going viral. After the shocking fight, a source told E! News that "event staffers were mortified" about the fight. The insider added that the Icons gala is supposed to be "the most exclusive and glamorous party," but their scuffle "overshadowed months of hard work and an otherwise fabulous night." Ah, don't you just love the smell of elitism at the end of summer? And when Minaj broke her silence about the incident on her Queen Radio show on Apple Music's Beats 1, she said it was "so humiliating" to go through that in front of such an "upper echelon" crowd. "The way they passed by looking at this disgusting commotion, I will never forget," she recalled. "I was mortified." 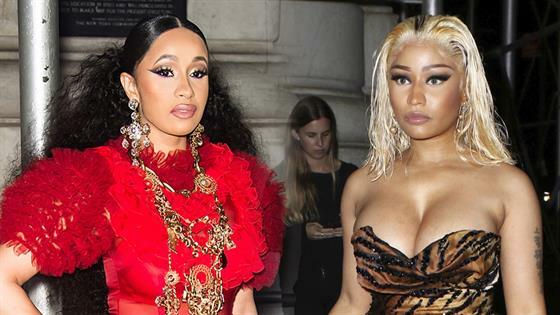 But here's the thing: Minaj and and Cardi B's fight is far from the first "ugly" event to go down during NYFW, with the semi-annual event having a long history of fights, showdowns and venues falling apart, injuring well-dressed attendees. In fact, drama can go down behind-the-seams, as reports recently surfaced that Marc Jacobs purposefully delayed the start of his show (which is always one of the most punctual) in order to prevent them from attending Rihanna's Savage x Fenty lingerie show, which took the grand finale slot away from him. "Some guests left to attend her show. It wasn't a mass exodus, but it was noticeable," The Daily Beast reported of Jacobs' show starting an hour and a half later than originally scheduled. While he didn't address the Rihanna rumors directly, Jacobs took to Instagram to "sincerely apologize" for and explain his tardiness, including a list of facts, not "excuses." "It was my wishful thinking that we could accomplish all that needed to be done for this show with the circumstances we faced," he wrote as one of the facts. "I was wrong. Not because everyone didn't make every effort or give it their all and more, life is just that way sometimes." Kors' isn't the only major designer to deal with venue issues, as several guests were injured when they were struck by falling lighting equipment during Diane Von Furstenberg's show in 2005. A Cosmopolitan fashion market director who needed stitches after being struck in the head sued the designer for medical compensation as well as payment for pain and suffering. Scandal would strike again for Kors, a former Project Runway judge, in 2003, when PETA crashed his show to throw tofu pies at Wintour and (gasp!) Sarah Jessica Parker. Of course, you can't relive past NYFW drama without bringing some Real Housewives into the mix, and the ladies of RHONY have definitely had their fair share of front row woes. In 2008, Jill Zarin stormed out of a Luca Luca show because she was NOT seated in the front row. She later tried to explain her behavior, saying, "I was having a bad day, was not in a good mood," and that she wanted to be home to see her daughter after her first day of school. At the Pamella Roland show in 2010, Bethenny Frankel and Luann de Lesseps got into a heated argument when the Skinnygirl mogul thought Lu was taking some digs at her over her feud with Zarin. "I don't like you and I think you're a snake," Frankel seethed. The Countess' response? "You're nasty and I'm not going to do this here." But Frankel's Fashion Week drama wasn't done just yet, as she was then seated next to co-star/enemy Kelly Killoren Bensimon. Awkward tension and a name-drop off immediately ensued! And just this past NYFW, the current roster of New York ladies apparently were causing somewhat of a scene at Pamella Roland's show, per the gospel according to Page Six. Dorinda Medley, Ramona Singer, Sonja Morgan and Tinsley Mortimer were all reportedly filming for the show, which was "disruptive" to the rest of the attendees. No word yet if Singer yelled for everyone to "Take a Xanax! Calm down!" At least the RHONY ladies' presence at a show ever got someone fired, which is what happened to Kelly Cutrone, she of The Hills' scary boss lady fame, when she had Ashley Dupre attend the Yigal Azrouël show in 2009. Don't remember who Duprel is? Well, get ready for a blast from political scandal past as she was the call girl who infamously hooked up with then NY governor Eliot Spitzer, so fashion insiders were aghast. "Following the showing of his Fall Winter 2009 Collection, Yigal Azrouël has decided to fire front-of-house PR Company, People's Revolution, for mismanagement," a press release sent after the event said, per the NY Daily News. Cutrone, cool as a cucumber as ever, told the paper, "I've been fired before, and I'll be fired again. It's the nature of our industry, and it doesn't upset me." Someone who was a little upset after an incident at Fashion Week? Nicole Kidman, with very good reason: she was being knocked over by a paparazzo on a bicycle outside of her hotel in 2013. "It was awful, but I got back up," the Oscar winner told E! News after the scary incident, which was caught on-camera. "It can be terrifying," she added of the paparazzi's sometimes invasive ways. But the saddest NYFW of all happened in 2012, when 95-year-old socialite Zelda Kaplan died after collapsing at designer Joanna Mastroianni. "I was sitting right next to her. She flopped over in my lap," Fashion Calendar published Ruth Finley told the Associated Press. "The show was just starting. I thought she fainted. Two men carried her out."